Xfinity X1 is simply extraordinary! X1 delivers the simplest, fastest and most complete way to access all your entertainment on all your screens. With X1, you experience TV and Internet together like never before with advanced search, personalized recommendations, apps at home and on the go and the fastest in-home WiFi for all rooms, all devices, all the time. You can control almost all aspects of your TV with the X1 Voice Remote. For a quick list of phrases you can use with your remote, see our Voice Command Tips. Open Netflix, Pandora, YouTube and more through your TV using X1 Apps. X1 is available to customers with Xfinity TV and Xfinity Internet service who have Digital Starter TV and Performance Internet service or above. Pricing is subject to change. Contact us for more information. To access the guide grid, press the Guide button on the remote control. Use the up arrow and down arrow buttons to move one channel at a time. Use the Page Up and Page Down buttons to move several channels at a time. To jump to a specific channel, search for it. Use the right arrow button to advance in the grid one time slot at a time; use the left arrow button to go back to the previous time slot. Use the FF button to advance in the grid one day at a time; use the Rew button to go back a day. You can also view channel information and program Information. Hit Exit to exit the guide. Notification Center: Use this option to see new notifications and a history of recent notifications. Notifications are intended to keep you up-to-date on everything you need to know about your Xfinity products. Notifications you may receive include tips on X1 features, upcoming appointment reminders, Xfinity Home alerts and more. To get started, see Xfinity X1 Notification Center. 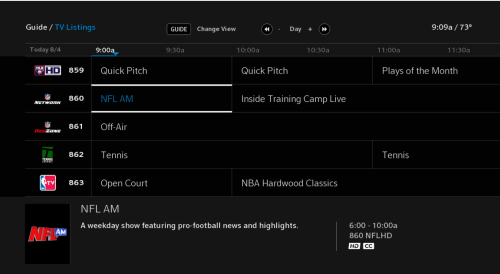 Guide: Use this option to access the X1 guide grid and view program listings, channel lineup, etc. You can also access the guide grid by pressing the Guide button on your remote. To get started with the guide, see these instructions on navigating your X1 guide. Press the Guide button twice to access other options such as movies and grids, etc. Saved: Use this option to access your saved recordings, recording schedule, favorites list, playlists and Xfinity On Demand purchases. This menu also includes For You, which has recently recorded programs, favorites, watched shows and recommendations based on what you've watched on Xfinity On Demand. 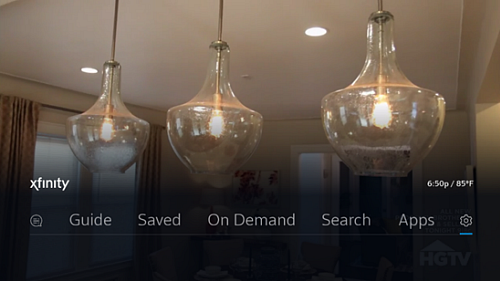 On Demand: Use this option to access Xfinity On Demand TV Shows and Movies to watch anytime. 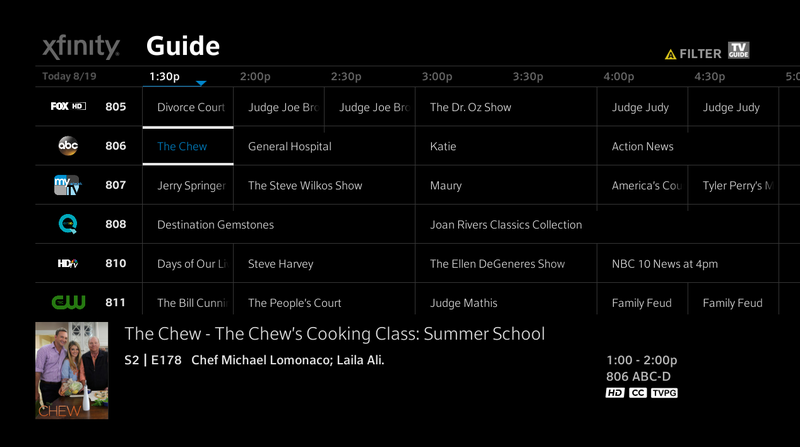 To get started with Xfinity On Demand, learn more about finding shows and movies in your X1 menu. Search: Use this option to search for live TV shows, On Demand programs and your DVR recordings. You can also search for favorite actors and directors, channels, etc. To get started with search, learn more about searching with your X1 search barand searching with the remote control keypad. Apps: Use this option to access the apps available through your X1 TV Box such as Pandora, Sports, Photos, My Account and more. To exit the menu, press the Exit button on your remote.